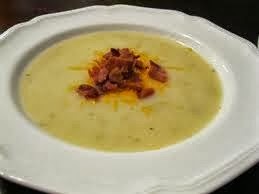 Cape Breton Tourism Spotlight: Cape Breton Potato Soup- Nothing Better To Warm You Up On A Cold Fall Day! Delicious. Cape Breton Potato Soup- Nothing Better To Warm You Up On A Cold Fall Day! Delicious. On a cold fall or winter day there is nothing better to take that nip out of the air than a delicious bowl of homemade soup. I must admit I am a soup lover, and so I want to share with you this recipe that I came across for potato soup. I hope you enjoy it. Combine potatoes, onions and water in a boiling pan. Bring to a boil. Add bouillon cubes, parsley, salt and pepper. Cook, covered, for 20 minutes or until tender.Meanwhile, cook bacon and drain off fat and set aside. Combine 1 cup of milk and flour. Add to soup. Simmer until thick,stirring constantly. Add remaining milk. Heat until hot. Crumble bacon over top and serve. This would be great served up with homemade rolls straight from the oven drizzled with butter. Enjoy!